The conjunctiva is a membrane that covers the sclera (white part of the eye) and lines the inside of the eyelids. It helps lubricate the eye by producing mucus and tears, although a smaller volume of tears than the lacrimal gland. It also contributes to immune surveillance and helps to prevent the entrance of microorganisms into the eye. Palpebral or tarsal conjunctiva: The conjunctiva lining the eyelids. 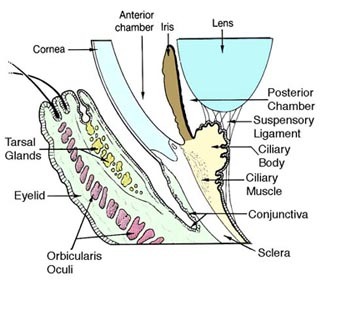 Fornix conjunctiva: The conjunctiva where the inner part of the eyelids and the eyeball meet, the palpebral conjunctiva is reflected at the superior fornix and the inferior fornix to become the bulbar conjunctiva. Bulbar or ocular conjunctiva: The conjunctiva covering the eyeball, over the sclera. This region of the conjunctiva is bound tightly and moves with the eyeball movements. Disorders of the conjunctiva and cornea are a common source of eye complaints. The surface of the eye is exposed to various external influences and is especially suspectible to trauma, infections, and allergic reactions. The conjunctiva is best known because of its inflamed state, conjunctivitis (more commonly known as pinkeye). Conjunctival irritation is one of the adverse health effects that can take place after overexposure to VOCs (Volatile organic compounds). This page was last edited 00:11, 9 August 2012 by wikidoc user WikiBot. Based on work by Cafer Zorkun, Alexandra Almonacid and Jacki Buros (bot) and wikidoc anonymous users Hovea and 71.3.197.141.